Four Faced Buddha of Bangkok,Thailand-A Famous and Miraculous Wealth Granting and Protector Deity but He is Not a Buddha! | Sana Ako si Ricky Lee! Thailand is one of most iconic Buddhist country. Their monks to this day still literally beg for their food. Many Buddhist, like myself, goes to Bangkok to see some of the most sacred and majestic Buddhist temples. And like most Buddhist I also went to see the iconic ‘Patron Buddha’ of the country, which is the Four Faced Buddha at the heart of Bangkok. The Erawan Shrine Four Faced Buddha is not a Buddha but a Brahma! 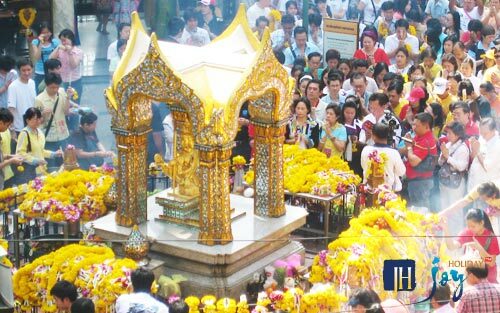 The famous Four Faced Buddha at Erawan Shrine draws both local and ‘international’ devotees as wells as tourists. The funny thing though, the Four Faced Buddha is not inside a Wat (temple in Thai), it is just in a small patch of land at Phloenchit Road corner Rajadamri Road. In fact, tall buildings around the area, a hotel, and Bangkok’s Skytrain tracks dwarf it. But do not be surprise to see that not a single minute passes by with a person praying or paying homage to the Four Faced Buddha. In fact, keeping the area uncluttered is a big problem for the city officials. They need to have somebody removed the flowers offered to the image every 10 minutes for 15 hours a day. If they fail to do this, the area will drowned in a sea of flowers offered to the Buddha. Although, famously called as the Four Faced Buddha, Thailand’s unofficial Patron Buddha is not a Buddha, it is a Brahma and technically it has nothing to do with Buddhism. However, Thai Buddhist monks have already quietly and unofficially recognized the 4-Faced Brahma as an unlikely Buddhist deity, that a lot of people has recognized it as a 4-Faced Buddha. In a way, it can be said that the Four Faced Buddha is now an ‘adopted’ Buddhist deity. 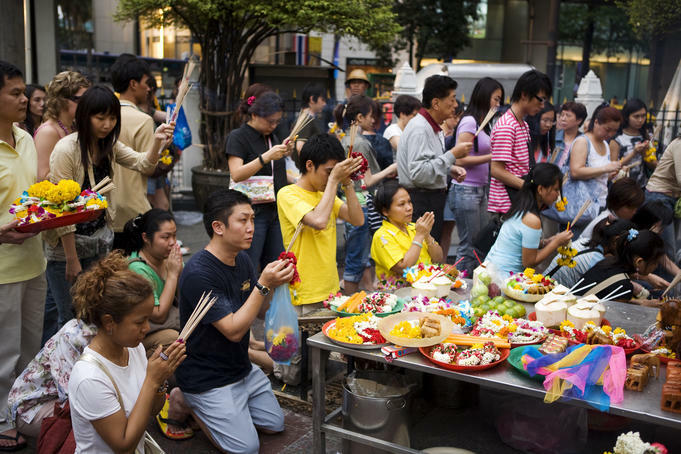 The picture depicts of that a usual day in Erawan Shrine. This is just any other normal day. Picture lifted from Joy Holiday site. There are a lot of Four Faced Buddha in Thailand, but the most popular one is the one Erawan shrine. One proof that the Four Faced Buddha in Erawan Shrine is really miraculous is how much money thankful devotees and worshippers throw in as an offering to the Buddha. In fact, the ‘joke’ there its their second central bank and that’s where they mint baht coins and print paper baht. The money is then used to maintain the shrine and also to feed some poor Thai families. While I was there I met an American guy who said that he believes that it was the Four Faced Buddha who saved his life. He said, on a previous trip to Bangkok his Thai friend toured him to Erawan Shrine, and this friend also gifted him with a Four Faced Buddha pendant. While he doesn’t a strong religious background, he wore the pendant out of respect and also out of sentimental value for his friend who has been nice. “Besides the pendant is quite nice. Exotic. If you know what I mean?” he added. Anyway, a few months after he got back to the United States, he experience a ‘…. miraculous event that made me believed in the Four Faced Buddha.” Apparently, while working on an electrical problem in his apartment, something that he felt he could handle on his own, he got electrocuted. He said it was really bad and that he literally felt all the electricity going through his body until he lost consciousness. According to him, his roommate saw him thrown off to the other side of the room! But he doesn’t have any recollection of this happening. He was rushed to the hospital and regain consciousness on his way there. After being observed he was released the following day. 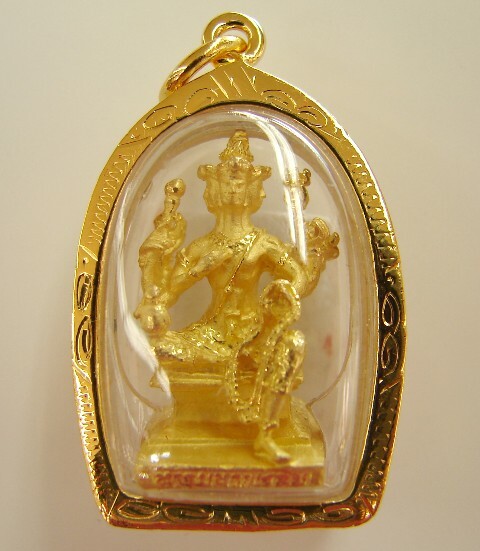 This is a typical Four Faced Buddha pendant that you can buy in Bangkok, Thailand. Some of the images inside are made of real gold. 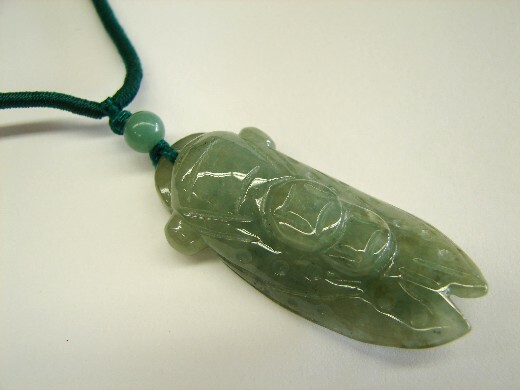 My own Four Faced Buddha pendant is similar to this one. On his way home he remembered his Four Faced Buddha pendant and thought the medics must have taken it off him. Resigned to the fact that he already lost the pendant, he just forgot about it. 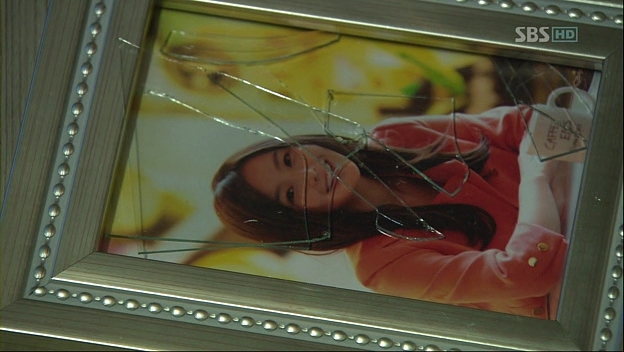 About a week after the incident when his roommate was cleaning the apartment, his friend saw his broken pendant under a cabinet. When the American saw his pendant, he just knew right away that it was the Four Faced Buddha that saved him. Another story I heard 3rd hand. My Thai host shared the story with me. He said his officemate was in need of big amount of money for her father who’s battling cancer. Upon the advice of their other officemate his officemate who is need of money went to pray to the Four Faced Buddha. 7 days after she prayed to the Four Faced Buddha she was asked to go S30 hotel in Bangkok to meet a client. When their meeting ended, she went to use the rest room and in the stall the she used she saw a bag that must have been forgotten by somebody. She opened the bag to search for identification as to who might own the bag. What she saw surprised her because there was a huge amount of baht and US dollars inside the bag. She was honest enough to admit that she was really tempted to just get away with the money because it will definitely help her with her financial woes, not to mention the fact tat there was nothing in which she can use to identify the owner of the bag. 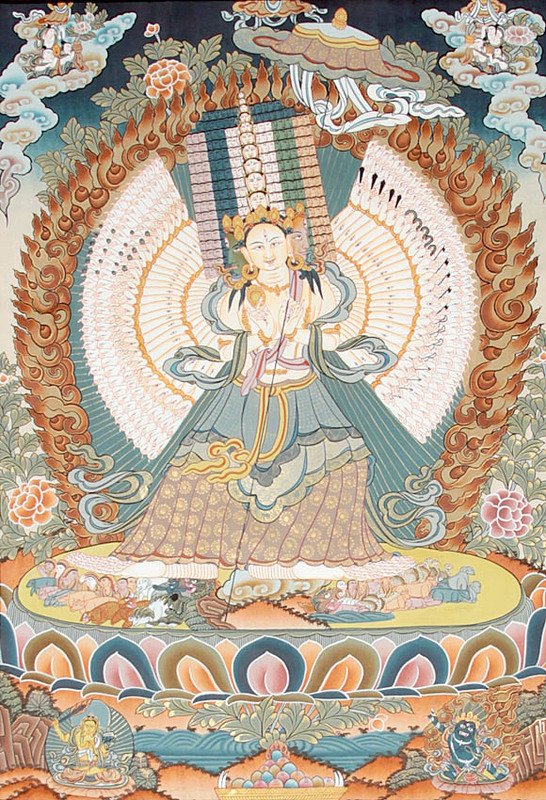 She even wondered whether this was the help sent by the Four Faced Buddha. As soon as thought of it she also realized that it’s quite impossible that the Four Faced Buddha will be sending help by getting the money from somebody else. She decided to just surrender the bag to the hotel manager. When she got to reception, there was a frantic girl being consoled by her client. As it turned out the frantic girl is the owner of the bag and she also happens to be the sister of her client. To make the long story short she returned the bag, to the obvious relief of the frantic girl. They have to 'clean' the shrine every 10 minutes, otherwise it will drown on a sea of flowers and offering and money! Two days later she got a call from her client. Her client knew of her financial problem because of her father illness from her boss, and as it turn out her client’s sister’s father-in-law is an oncologist in Bumrungrad International Hospital in Bangkok, out of gratitude they offered to help her father. Not only will the father-in-law waive his professional fee, he also arranged for somebody to shoulder the medical bills of my host’s officemate’s father. My host said that the father of his officemate is now alive and ‘kicking’! They now visit the Four Faced Buddha every week! Still another story was shared with me by another devotee who I met online thru the course of my ‘research’ about the Four Faced Buddha. J is a Malaysian Chinese businessman. He visited the Four Faced Buddha at the Erawan Shrine the first time he visited Bangkok. The tour guide told him that the image is miraculous and that it will grant all good wishes. J said he is not a very religious person but seeing the number of devotees that visits the site something just prompted him to ask for his ‘simple’ wish. He has been hoping to expand his business, having 5 children he wants to make sure that he is able to make sure that all children will have financial wealth that he can passed on to them when he gets older. J said while he was sincere in asking for the Four Faced Buddha’s help, he really didn’t give much thought to it. Until he slowly notices that his business was expanding, getting bigger, and more secured. By that time he has already forgotten about the wish that he has asked from the Four Faced Buddha of Erawan Shrine in Bangkok, Thailand. Nevertheless, he was really thankful. He decided to see a Taoist monk friend; J wants the Taoist monk to conduct a thanksgiving ceremony. While talking to J the Taoist Monk suddenly had a ‘vision’ and told J that the best way for the thanksgiving is to thank a man with four faces. The Taoist monk was not sure about his vision but J understood it right away! It was the Four Faced Buddha who granted his wish! Since then J would travel to Bangkok once or twice a year simply to give thanks to the Four Faced Buddha. Every time he is there he would donate some flowers, incense, fruits, Elephant images, and he would always leave 15,OOO Baht as his thanksgiving. In a way he is trying to pay it forward. He also has invited an image of the Four Faced Buddha into his house and all his family even his grandchildren all wear the image of the Four Faced Buddha as an homage to the deity who granted them wealth. The Four Faced Buddha in Erawan Shrine in Bangkok, Thailand is the most popular miraculous Four Faced Buddha in the world. The irony here is that a number of its devotee becamae a devotee after their first visit to the shrine. Meaning, a number of them visited the site without prior devotion but because they experienced a miracle after the visit they started becoming worshippers of the Four Faced Buddha. However, you don't really need to go to the site to pray to Four Faced Buddha. You can all on him where ever you are. It’s not surprising that the Four Faced Buddha is miraculous, because even the story of its placement in that particular site was sort of a miracle. In 1956, the government was building the government-owned Erawan hotel. However, the government failed to consult geomancers as to what is the best time to built the hotel and this proved to be problematic. They were several accidents and labor problems that the construction workers threatened to walk out of their work, several times. 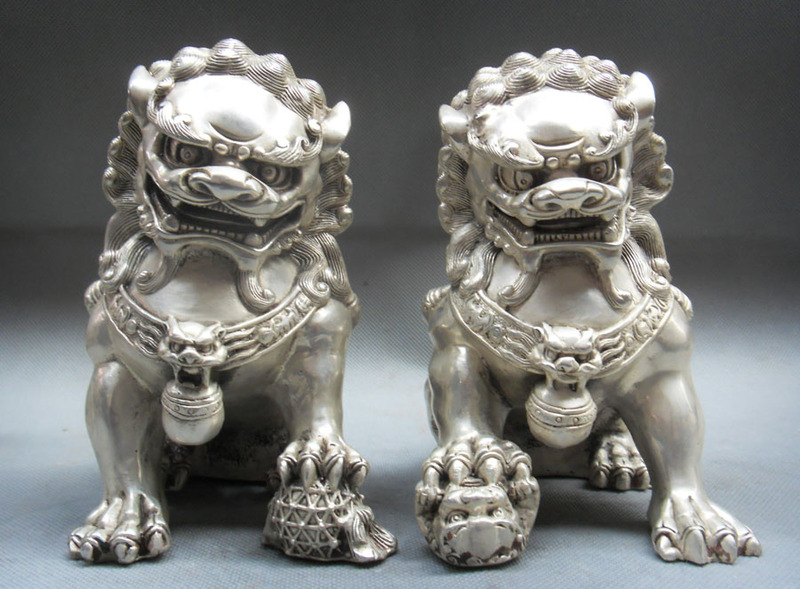 Geomancers, Feng Shui experts, and Geomancers were called in to assess the problem. They reminded the government that the area used to be a dumping ground of people who were salvaged and also criminals were also used to be displayed and killed in the area. 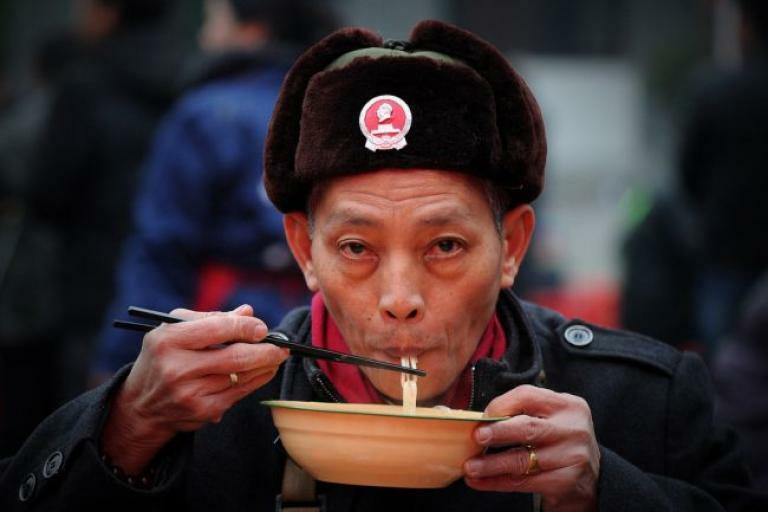 In fact, a portion of the place has become a ‘hungry ghost house’ of these troubled souls. They recommended putting an image of the Four Faced Buddha at the location where they identified as the ‘hungry ghost house’. I’m not really as to how they came about the decision that the image that should be placed there is that of the Four Faced Brahma, but after its installation construction went on smoothly and Erawan Hotel became a landmark until it was replaced by the Grand Erawan Hyatt Hotel in 1987 who happens also to be one of the most successful chain of Hyatt. The image that you’ll see there now is not the original statue. The original one was destroyed by a mentally ill man who smashed the statue completely destroying it! Some people believed that the man is possessed by the devil. Some people who are in the area chased the man and UNFORTUNATELY killed the guy. The incident completely stunned and saddened the whole nation, a lot of Thais openly wept for the destroyed image, and they all felt that there’s a great misfortune that is about to befall their country. True enough 7 months after the incident they saw one of the most violent political crisis Thailand faced in modern era, Prime Minister Thaksin Shinawatra was ousted from his position by a coup de’ tat! 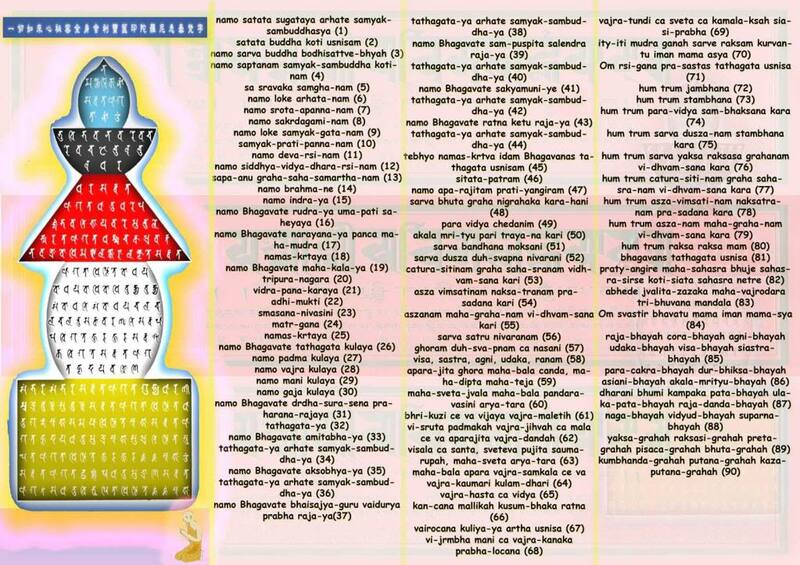 Last May 21, 2006 at exactly 11:39am they have installed a new image of the Four Faced Buddha or Four Faced Brahma. It’s now made of a special alloy that consists of 9 different metals which includes the remnants of the first image and gold and silver. 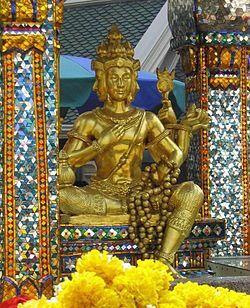 I personally don’t have any ‘miraculous’ story to share about the Four Faced Buddha, however, you only have to go to the Erawan Shrine in Bangkok to see that its impossible for it not to be miraculous given the number of its devotee or worshippers who attests to the power of the Four Faced Buddha! ← Receive Showers of Blessings by Tapping Two of the Most Powerful Mantras! You can always thank the Four-Faced Buddha wherever you are. It’s quite easy to find the Four Faced Buddha pendant, it’s practically sold at every department store in Bangkok, or if you go to the Four Faced Buddha, you can also get it at the stores around the area. Price really varies, there are some pendants that are made of real gold or are plated with gold. Just remember to haggle for a good price. For example, if they say it’s 100 Baht, say you want to get it for 20 Baht, until you get to half of the original price it was quoted. Sometimes, you even need to pretend that you’re no longer interested and is about to leave without buying the pendant, so that they’ll give it to you at a price that you want. Thanks JP for the advise. 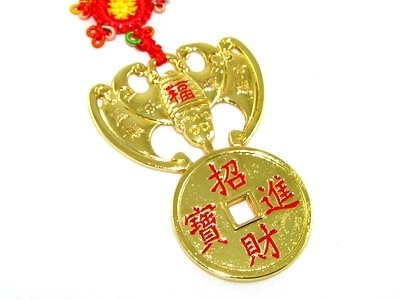 May I know if the pendant has been blessed or “Kai Guang” already? If it hasn’t been, how do I get it blessed? Unless you get it from a monk or a Feng Shui expert, always assume that your pendant is not blessed even if the store seller tells you that it’s been blessed already. 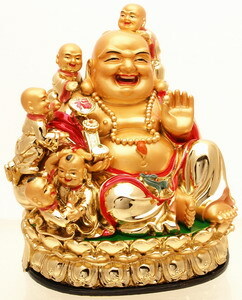 To have it blessed just go to the Four Face Buddha shrine and pass it over the incense smoke/incense burner three times. If you’re right handed do it counter clockwise, if left handed do it clockwise. 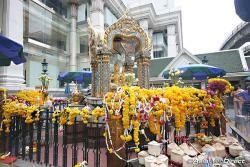 i’m going to Bangkok in August and would like to visit Erawan Shrine. But i cant find the exact opening time…. They’re really open 24/7. However there are times when some people ‘perform. I think it’s really around 7pm. Hii..I just got a four face buddha pendant today..do I need like pray it or just normal wear it?? Do I need pray everytime I wear it?? You can have it bless once and wear it. process of adopting buddhisum in Bangkok mail me how I can become Buddhist. In order to pray 4 Faced Buddha , its the same for male or female , u pray from the first face to the fourth clockwise, hope it helps. First Face : You can ask for anything related to HEALTH. Nagpunta po ung sister ko sa Thailand, and nagrequest po ako sa kanya na ibili nya ako ng four faced buddha pendant.Hindi po sya sure kung na blessed po ung pendant.pano po mapapa bless ung four faced buddha pendant kung wala na po sa Thailand? If you can go to the a temple just let it pass by the incense three times. Hi, my son is having speech delay but he is catching up day by day, however he does not want to write and in addition to the above above, he likes to shout when he is excited. Can I bring him to four faced buddha for praying? Sure. 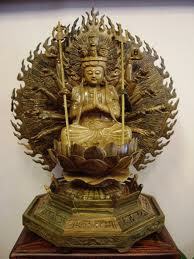 But I think for this Kuan Yin will work better.